Mysteries of History: The Art of Fencing ~ The History Girl! Mysteries of History: Visa or MasterCard? The art of fencing has been around for many years and the first evidence of two people dueling appears in a drawing in Egypt. Archeologists dated the crude drawing to 1200 BC; the drawing depicted two Egyptians using swords equipped with safety tips and face masks. In the Greek and the Roman Empires, gladiators preferred short swords and a light weight spear, and both taught their warriors in schools named Ludi. The collapse of the Roman Empire, around 476 AD, brought crudely made iron weapons from barbaric invaders, which signaled a deterioration of fencing throughout the Dark Ages. Lightweight and fast weapons, such as the Rapier, were invented during the Renaissance, which allowed swordsmen to develop a style of their own. During the 15th century, fencing as we know it today was born. The country of Spain was the first to develop skilled fencers; the years 1471 thru 1474 brought printed manuals explaining the rules and fundamentals of the sport. 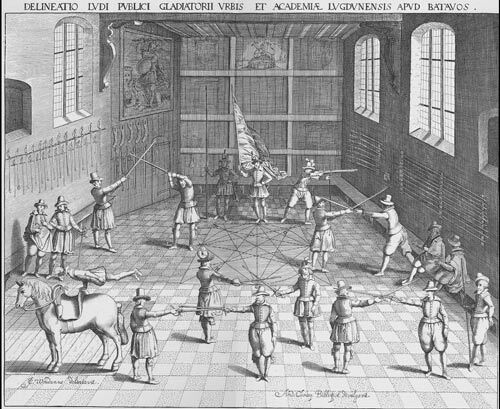 Swordplay guides like Marxbruder, from Germany, began spreading across Europe like wildfire. In 1500, the Italians began wide-range use of the Rapier sword, and the master of that time was Agrippa, who invented the four maneuvers of the fencing positions: prime, seconde, trierce, and quarte. 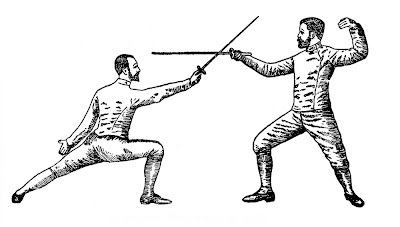 Other masters, such as Grassi and Vigiani, invented the technique, the lunge, which became popular in this era. Dueling emerged in the 16th century. In fact, there were more aristocrats killed in duels than there were in any war of the era. The Queen of France, Catherine de Médicis, employed many fencing masters, which developed the art of fencing for the French nation. In 1567, King Charles IX, Catherine’s son, officially recognized the French Fencing Academy, and awarded many prestigious titles to the new French masters. Henry de St. Didier, the first French master, published a treatise and became one of the first to advocate the extreme use of the Épeé sword instead of the Rapier. Major changes came to the sport during the 17th century; the fleuret (foil) was developed as a lighter training weapon for dueling purposes. A set of rules named the Right-of-way, which brought the event a series of attacks and defense moves. With these measured movements, the duelists were less apt to spear one another; thus the new technique reduced the number of fatalities from the sport. Fencing School at Leiden University, 1610. In 1780, French fencing master La Boessiere developed one of the single most important pieces of equipment, the face mask; this new apparatus started the ongoing strategy of non-fatal techniques. When the French Revolution began in 1798, the French Fencing Academy was terminated, leaving the masters to practice the art of fencing on their own. By the 19th century, dueling declined as a way to settle disputes; the victor would face incarceration for assault or manslaughter. At that point in time, fencing became outlawed, which left the schools no other choice but to teach fencing as a sport. The focus shifted to defeating the opponent without slaughtering one another. Afterward, the duels ended with a crippling thrust to the arm or the leg, thus giving way for fewer legal actions for the participants. In 1850, the country of Hungry developed a new school which featured Sabre fencing that dominated the art. Italian and French immigrants began to arrive in the United States between 1860 and 1870, and brought with them their form and techniques of fencing. By 1874, these fencing masters founded the American Fencing School. During this time period, dueling was considered a non-lethal sport with structured rules. In 1896, men’s Sabre and Foil competitions were performed in the modern Olympic Games and men’s Épeé joined in 1900. Women's foil would not join the Olympic Games until 1924 and women's Épeé seventy-two years later, in 1996. German native Helene Mayer (1910-1953), became the German Foil champion in 1924; she was only thirteen years old. She competed in the 1932 Olympic Games and that year she was barred from the Offenbach Fencing Club in Germany, because she was Jewish. From that day forward, Helene stayed in the United States. During the early part of the 20th century, the masters of this age-old sport were mainly from France, Italy, and Hungry. The International Fencing Federation was founded in 1913 in France. A new development came to the sport in 1936; the Electric Épeé was invented, which changed the art all together and then the Electric Sabre and Foil soon followed. Although the French, Italians, and the Hungarians were masters of the sport, it was during the 1950s when the Soviet Union and Romania became the new masters. They achieved this great feat with their emphasis on speed and mobility, using touches prior to 1936 that had gone undetected. During a modern day bout, a judge or director sits opposite the score keeper, and his or her responsibilities include: making sure all the equipment is safely used; supervising the bout; starting and stopping the play; observing and recounting the actions; awarding points; and penalizing faults. 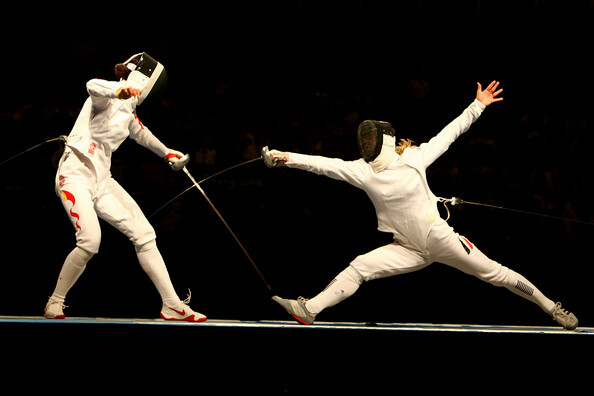 A typical fencing bout lasts six minutes and is played until one player scores five points or time runs out. If the bout ends in a tie, the play continues until the tie breaking point is achieved.